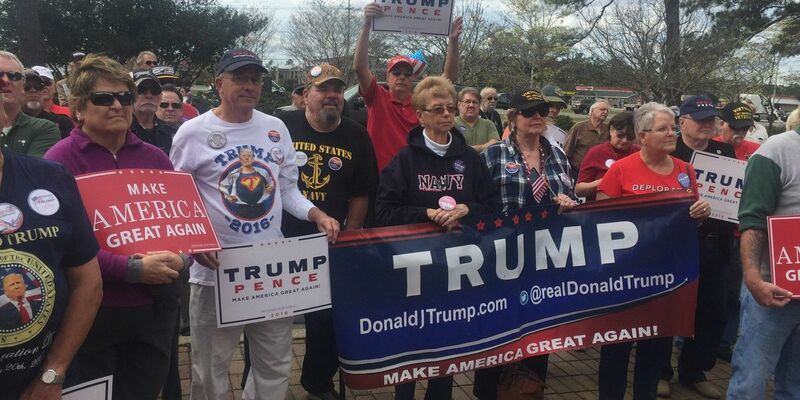 CONWAY, SC (WMBF) – A group gathered in Conway on Monday with a very clear message - they support President Donald Trump 100 percent. These individuals were there to take part in a "Spirit of America" rally. Many in the crowd felt the country needs to come together and stand behind the current president. "It's not about Republican or Democrat; it needs to be about American," said attendee Jason Allman. Allman and his family were visiting from Ohio and happened to be driving by the rally when he and his wife decided to stop and show their daughters, who are just 4 and 5 years old, what it is to support the president. "It's what it's all about, the children, have a better life for our children," Allman said. "I think that's what Trump is trying to do, turn this country around." Carlene Carmen was one of many veterans in the crowd and proudly held a sign that read, "President Trump fights for us, now we fight for him." She is urging others to do the same. "Well yeah, you have got to support who is representing you," Carmen said. She recalled meeting Mr. Trump and sticking out her hand for a handshake. "You know what they are, and who they are, by a handshake," Carmen said. "When I shook his, it was passionate. I felt his passion." Though President Trump is moving at a fast pace, the group in Conway was happy to see he is coming through on his campaign promises so quickly. "Just come out. Come out and show your support for him," Allman said. "He's doing everything he said he would do." While speakers hit on topics like the repeal of the Affordable Care Act, immigration laws and bringing jobs to the country, they also urged the crowd to make sure their support is heard loud and clear through platforms like social media.